CP Communications has been a staple at MLB All-Star Games for many years, but the company set a new bar with its largest presence ever at the event in Washington this week. Running out of CP’s RF7 mobile unit, the 27-person crew rolled out 14 total RF cameras for MLB, Fox Sports, and ESPN; laid down a whopping 50,000 ft. of fiber; and provided full communications connectivity to all clients via Omneo, Dante, and/or analog headend. In addition to providing a full arsenal of equipment at All-Star, CP Communications handled RF coordination for all events at Nationals Park. MLB Network’s expanded role at All-Star this year meant a major expansion for CP Communications as well. The company not only supplied equipment for the network’s studio shows, Red Carpet Show, and world-feed production as it has in the past but also provided equipment for Play Ball Park (across the street from Nationals Park), MLB’s digital productions, and MLB Properties. CP Communications RF technician John Mureddu tests out Fox Sports’ MōVI Rig at MLB All-Star in Washington. 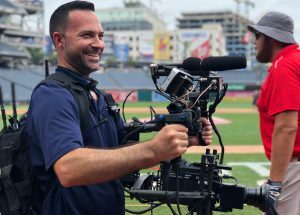 MLB Network’s onsite pre/postshow productions at All-Star featured an RF Steadicam (shared with Red Carpet Show), an RF handheld (shared with the world feed), and RF batting-cage POVs (two Flare cams). CP also managed the Dante audio network for control of the main set on field and a secondary set on the concourse, four high-power PL (HPPL) two-way intercoms, 12 channels of digital repeater, and approximately 100 radios. CP also provided Shure Axient digital mics for MLBN’s Red Carpet Show (along with the Dante audio network and 1.4-GHz mics) and Play Ball Park. 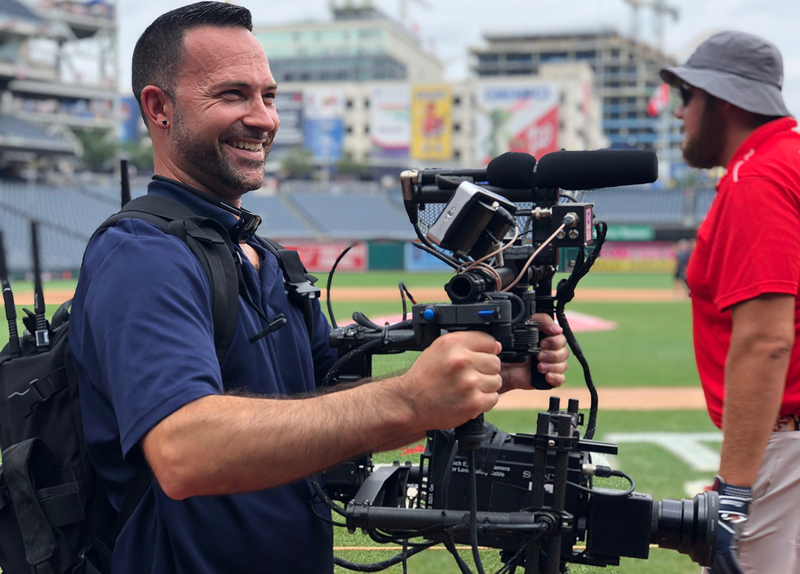 In addition, CP served the MLB Digital shows with an RF handheld (with Wave Central integrated transmitter and paint receiver on a Sony HDC-4300 camera head) and MLB Properties with a Pliant CrewCom system for coverage of the Home Run Derby. The wide-area coverage was integrated with ESPN and the Nationals scoreboard control and further integrated with Fox for the All Star Game. For Fox Sports’ All-Star Game and Media Day efforts, CP provided a pair of RF cams (a MōVI with a Sony P1r and a Sony HDC-2500 handheld), the field EFX audio-submix package, 39 RF mics (four talent, six player, two ump, eight FX, three bases, and 16 in-ground), nine parabolic dishes, three HPPLs, and 80 radios for comms. ESPN was once again a major client for CP at All-Star, its Home Run Derby production using four RF cameras (shared with the Baseball Tonight onsite studio show), eight RF player mics, eight RF EFX mics, four RF handheld mics with talkback, four RF IFBs, and four in-ground microphones. In addition, both the Home Run Derby set and the Baseball Tonight set required six Sennheiser head-worn microphones and six stereo RF IFBs (Baseball Tonight also used a Clear-Com Freespeak comms system with four beltpacks). Pardon the Interruption was onsite for live shows on the field, using four Sennheiser head-worn microphones and four wired IFB listen boxes. For ESPN Deportes, CP Communications provided an RF handheld mic with talkback, an RF IFB, four Sennheiser head-worn microphones, four Studio Technologies announce consoles, and a wireless PL.